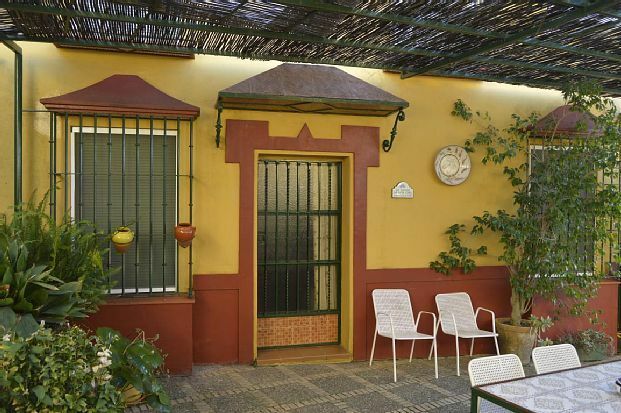 A short distance from Seville, ideal for comfortable stays that combine visits to the city with rural tranquility. Strategic point near El Rocío, Doñana National Park, and beaches of Huelva. Discover the traditional Andalusia staying in our rural homes. Built on what used to be an old corral and horse breeding stables, Casa "El Tamboril" is currently a tourist accommodation for rural accommodation legalized by the Ministry of Tourism of the Junta de Andalucía and adapted to the needs of the traveler to enjoy of your stay as if it were your house. The house consists of three large and bright double rooms, two bathrooms, kitchen, living room with fireplace. Outside have a patio with flower beds and pots that give a pleasant and environmental environment to the room, inviting rest, reading, relaxation, ... There is also a place for barbecue and pool. In the heart of Sevillian Aljarafe and gateway to the Doñana Natural Park. The house, built in 1999 on what were some old stables of horses, hayloft and charret garage, has all the comforts without losing a bit of its rustic character. Its geographical location makes it an ideal place for rural tourism with children or the perfect destination to disconnect a bridge or weekend as a couple or in a group, enjoy the natural environment or simply break with the routine. Typical Sevillian house on 2 floors. On the top floor 3 bedrooms and a bathroom. On the ground floor living room, kitchen and another bathroom. With capacity for up to 9 people. (The normal occupation is 6). 3 rooms with air conditioning hot and cold. Living room with TV and fireplace. Fully fitted and equipped kitchen (fridge, washing machine, microwave, ceramic hob, coffee maker, toaster, utensils, ...) 2 bathrooms. Free Wifi Sheets and towels included. Cot upon request. Outside barbecue and patio with picnic area. Parking for 1 or 2 cars inside the plot. Legalized house in the tourism register with the number VAR / SE0007 The house is rented complete. Asphalted access.